A visit to Orlando Florida does not have to break the bank with expensive theme park tickets. There are a few things you can do in and around Orlando for free. Go to VoyageMonkey.com Travel to learn more about Orlando and find the best Orlando hotel accommodations, flights and car rentals. There’s plenty to do around the Disney Resorts. Anyone can explore Disney Springs or the Disney’s Boardwalk for free. Disney Springs is a fun dinning, shopping and live entertainment complex. While you will have to pay to dine or shop, there’s no cost to walk around, see the sights, and take in the Mouse magic. You might be able to catch some of the regular entertainment, or a free festival or event. Disney’s Boardwalk is another charming part of the Disney Resort that is free to the public. The Boardwalk is another dining, entertainment and shopping complex set lakeside. It is a great place to take a walk, people watch, and grab a meal (meal not free). There is often free entertainment here. Be sure to visit Disney’s Boardwalk at night and get a view of the fireworks from the theme park. You can also view the fireworks for free at the Disney World transportation center or the marina at the Grand Floridian Resort. The firework shows are always spectacular, and free when you can view from outside of the theme park. Near the Disney Resorts, Celebration Florida is a quaint small Americana town featuring various styles of architecture with a Disney Main St. feel to it. Stoll through the town and you’ll find charming restaurants, café’s, and boutique shops. There are some interesting things to see while walking around the town. All the local shop owners are super friendly. You have to visit Celebration if you’re staying near the Disney Resorts. Near the Universal Resorts, you can visit Universal Orlando’s CityWalk. This is an active spot, filled with music in the air and the scent of delicious foods. CityWalk is the perfect place to stroll around and hang out after a long, busy day of free sightseeing. Here you can enjoy dinner, listen to live music, sing Karaoke or Salsa dance at the Latin Quarter. You’ll meet plenty of fun people here from all over. If you enjoy the great outdoors (of an urban park), downtown Orlando’s Lake Eola Park is a hidden gem of a free activity. The park is a great place for a romantic stroll under the city lights before your downtown dinner or show. It is a great place for a picnic or taking in some sunshine. The nearly 1-mile sidewalk loop overlooks the lake, making it the perfect backdrop for a walk or run. You can enjoy one of the free concerts at the park’s Amphitheater. Orlando’s Harry P. Leu Gardens offers free admission Mondays throughout the year. You can stroll through the multiple gardens without paying a dime. You’ll enjoy a self-guided tour through the gardens and sights which include the Butterfly Garden, Horseshoe Fountain, and Lake Rowena Overlook. You can enjoy some Orlando tranquility for free. Of course you can take day trips from Orlando to Daytona Beach, Cape Canaveral, Cocoa Beach, and Tampa Bay. You don’t have to spend anything at those destinations to enjoy some great sights and free outdoor activities. If you want some free outdoors to enjoy and explore, visit the Ocala National Forest. Located a short drive north of Orlando, the Ocala National Forest has over 380,000 acres of forest to enjoy. With over 600 lakes, rivers, and springs, the park is the perfect place to hike and enjoy an adventure without the price tag. Voyagemonkey.com Travel can find you the best Orlando travel accommodations. If you need travel reservations for convenient flights, cruises, and hotel accommodations to any destination, visit VoyageMonkey.com Travel, or call us at 650-368-6192. You can book online or call our travel consultants who can assist you in planning your getaway. The recent widening of the Panama Canal is allowing the cruise industry’s newest and largest ships to easily be repositioned back and forth between the east and west coasts of the United States. Historically, the west coast market has been served by smaller and thus older ships. After several years of poor European cruise seasons marred by terrorist activity, the west coast market, with its thriving economy, is the place for the cruise industry to be. West coast cruises are generally available out of San Diego, Long Beach, Port of Los Angeles, San Francisco, Seattle, and Vancouver. Go to VoyageMonkey.com Travel for the best cruises, hotel accommodations, flights and car rentals. This year, the Norwegian Bliss made her debut in Seattle and is currently on a west coast itinerary. The ship is 168,028 tons, has 20 decks, and 2,220 staterooms for around 4000 passengers. Next year Royal Caribbean International will reposition the 2-year old ship, Ovation of the Seas, to Seattle, adding another 168,000 ton ship to the west coast. In December 2019 Carnival Cruise Lines will launch its brand new 133,500 ton Carnival Panorama out of Long Beach California. The Panorama will hold 3,954 passengers. Its seven-day itinerary will depart from Long Beach every Saturday to the Mexican Riviera, including Cabo San Lucas, Mazatlán and Puerto Vallarta. Carnival should make a big slash with its new Carnival Panorama, encouraging competition. Although the cruise industry has recently added ports of call along the California coast, the Mexican Riviera itinerary is still a mainstay of the market. The larger and newer ships are expected to serve this west coast market first, along with the Alaska itineraries. Offering more ports of call in U.S cities like San Francisco, Monterey, and Santa Barbara, opens up a broader west coast market. These California and Alaska cruises offer more cruise choices to travelers who are uneasy with traveling to Mexico. Celebrity Cruise Lines will continue to serve the west coast with 10 ports of call, including Monterey, Santa Barbara, Catalina, Los Angeles, San Diego, and San Francisco. Princess Cruises will also offer itineraries visiting Monterey, San Francisco, Santa Barbara and San Diego. The 5-year old Royal Princess based in Los Angeles will offer the Classic California Coast itinerary. 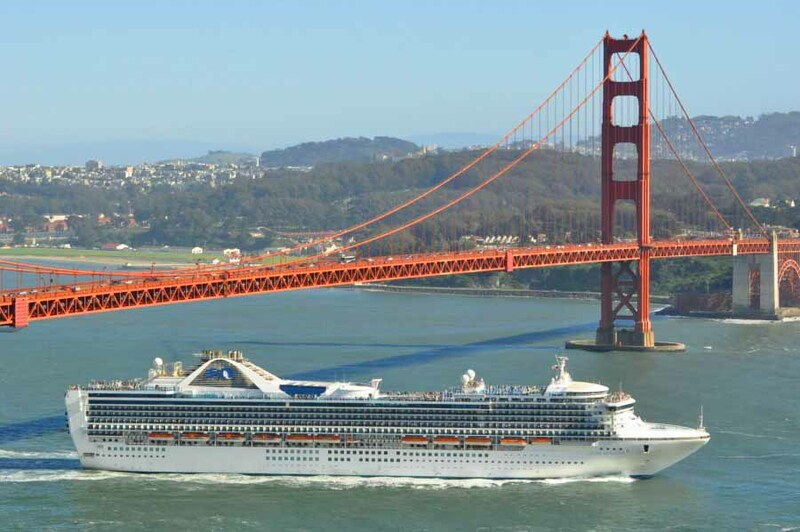 The Grand Princess based in San Francisco year-round, will offer a choice of cruises between either the classic California coast with a stop in Ensenada, or a Pacific Northwest cruise with a stop in Vancouver. Other major players are also serving the market with plans to upgrade ships. Once newer ships arrive on the west coast, it will be harder for the older ships to compete. We should see more repositioning of larger ships to the west coast as the market plays out. Sailings on these newer ships are booking up well in advance of the ships arrival. Voyagemonkey.com Travel can find you the best stateroom available on any particular sailing. If you need travel reservations for convenient flights, cruises, and hotel accommodations to any destination, visit VoyageMonkey.com Travel, or call us at 650-368-6192. You can book online or call our travel consultants who can assist you in planning your getaway. VoyageMonkey.com Travel recently received some questions about using a driver license to board a domestic flight. Beginning Oct. 1, 2020, if you plan to use your state-issued ID or license to fly within the U.S., make sure it is REAL ID compliant. 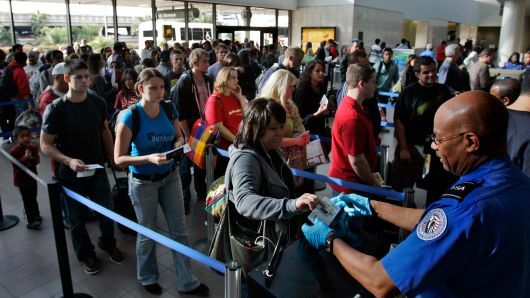 Adult passengers 18 and over must show valid identification at the airport checkpoint in order to travel. If you don’t possess a REAL ID compliant identification card, you will still be able to travel domestically with a valid passport. TSA does not require children under 18 to provide identification when traveling with a companion within the United States. Contact the airline for questions regarding specific requirements for travelers under 18. What is a “REAL ID” compliant card and why do you need one. Passed by Congress in 2005, the REAL ID Act enacted the 9/11 Commission’s recommendation that the Federal Government “set standards for the issuance of sources of identification, such as driver’s licenses.” The Act established minimum security standards for state-issued driver’s licenses and identification cards and prohibits Federal agencies from accepting for official purposes licenses and identification cards from states that do not meet these standards. States have made considerable progress in meeting this key recommendation of the 9/11 Commission. If you are not sure if your ID complies with REAL ID, check with your state department of motor vehicles. The California Department of Motor Vehicles (DMV) began offering federal compliant REAL ID driver licenses and identification (ID) cards in 2018. The “optional” card is being made available to Californians who want to continue to use their driver license or ID card to board a domestic flight or enter secure federal facilities when new federal requirements take effect October 1, 2020. Californians have the choice to apply for a REAL ID driver license or ID card, or renew or apply for a federal non-compliant driver licenses and identification (ID) cards. Business as usual until October 1, 2020. After that date, only a REAL ID card or other federally approved documents will be accepted, such as a U.S. passport, passport card or military ID. If you need travel reservations for convenient flights, cruises, and hotel accommodations to any destination, visit VoyageMonkey.com Travel, or call us at 650-368-6192. You can book online or call our travel consultants who can assist you in planning your getaway. Royal Caribbean’s newest and largest cruise ship in the world, Symphony of The Seas, will begin sailing from Miami Florida starting November 2018. This 228,021 ton ship has so many onboard activities and amenities, it will keep you entertained and pampered all day long. The ship’s itinerary is scheduled to alternate between the Western and Eastern Caribbean on 7-day cruises, both including a fun day at Royal Caribbean’s private island & waterpark, Cococay. The beach there is awesome and kids love the waterpark. Go to VoyageMonkey.com Travel for the best cruises, hotel accommodations, flights and car rentals. At 1,188 feet long with 18 decks, this ship has a lot of room to roam around. Here are some of the features of this new Megaship. The ship has 18 decks and includes a large gaming casino, large theatre (featuring the Tony Award® winning Broadway hit, Hairspray), an aqua theatre (featuring divers and acrobats), and, world-class spa & fitness center. There is an Ice-skating rink, a large sports bar & arcade, glow-in-the-dark laser tag, and over 20 bars & lounges including live music. Spend the evening in the disco dance club, comedy club, Piano or Karaoke lounge. There is also a large solarium, carousel, beauty salon, small shops, and an array of swimming pools and whirlpools on the upper decks. Here on the upper decks you can find plenty of outdoor activities, including a water-park, a 10-story waterslide, twin flow rider surf simulators, a basketball court, miniature golf course, zip-line, a 43-foot rock-climbing wall, outdoor movies, day-time & late-night pool parties, and live music & entertainment daily. After your activities, a massage and some pampering in the spa is the perfect way to end the day. Whether it’s formal sit-down fine dining or grab n’ go meals, the dining options are too many to mention (around 20). There is something for everyone’s taste at all hours of the day, from Sushi & Seafood to Italian, steak, chops, burgers, and more. The food quality is top notch compared to most fine restaurants on the mainland. The service in the main dining rooms is professional and friendly. Room service is available so you can dine on your balcony at any time. There is food and drinks everywhere, so take it slow so you don’t put on too much weight. The Symphony of The Seas offers the Ultimate Family Suite, which is perfect for families with kids they want to spoil. The two-story suite includes your own slide between floors, a private 3D cinema, an air hockey table, bumper pool on the wrap-around balcony, and more. You will need to book far in advance for the Ultimate Family Suite. There are plenty of other category large suites available on this ship to accommodate those wanting more room, without a slide and bumper pool. There are a total of 2,759 staterooms and suites. Voyagemonkey.com Travel can find you the best stateroom available on any particular sailing. If you need travel reservations for convenient flights, cruises, and hotel accommodations to any destination, visit VoyageMonkey.com Travel, or call us at 650-368-6192. You can book online or call our travel consultants who can assist you in planning your getaway. Santa Barbara is a wonderful beach town, isolated 90-minutes north of the hustle and bustle of Los Angeles, and around 4 and a half hours south of the San Francisco Bay Area. The area is popular for its California central coast wines and nice beach weather. If you are a dog owner that likes to travel, Santa Barbara offers some dog friendly hotels and restaurants, as well as parks and beaches. Go to VoyageMonkey.com Travel for the best hotel accommodations, flights and car rentals. The Fess Parker Hilton caters to dogs up to 75 lbs. (wink, wink). Dogs are greeted at the door with a dog biscuit and cool water. They give your dog a greeting package that includes: a dog room service menu; info on the hotel’s dog friendly restaurant (The Set); and, a list of local dog friendly restaurants, attractions, and dog information. All the hotel staff are super friendly to your dog, and you. The hotel is across the street from the beach, just south of State Street and Sterns Wharf. It is a prime location for walking the town with your dog. State Street is the town’s “Main Street” that starts at the beach and runs inland. The street is lined with restaurants, bars, shopping and entertainment. There are several places you’ll find to dine with your dog on a patio, and many of the stores allow you to bring your dog inside. The Paseo Nuevo shops on State Street has some dog friendly shops. Sterns Wharf is a historic pier at the end of State Street, with a few shops, restaurants, and eateries. You’ll find an eatery or two like the Santa Barbara Shellfish Company that have dog friendly picnic benches on the pier. Dog friendly restaurants within a short walk from Sterns Wharf include the Santa Barbara FisHouse and the original Sambo’s (both across from the beach). There are several beachfront parks along the water front where your dog can walk on some grass and meet other dogs. If you drive north a couple miles you’ll get to Arroyo Burro Beach Park (Hendry’s Beach at the Boat House Restaurant). This is a popular beach for dogs. Dogs need to be on leashes. If you want to let your dog off leash, the adjacent Douglas Family Preserve allows it. The preserve has great hiking paths and ocean views. Another popular dog beach is Summerland Beach to the south. The Summerland Beach Café is dog friendly. The Santa Barbara Botanical Garden is also a dog friendly attraction that gets you and your dog outdoors. 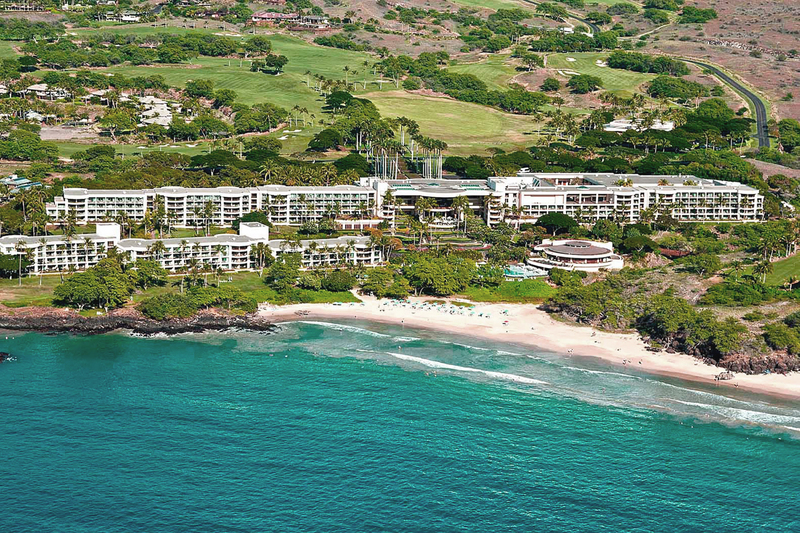 Hotels get busy in the summer, so plan ahead. Cruise Ships visit Santa Barbara regularly during Spring through Fall. You can check the City’s cruise ship visit schedule online to avoid the cruise days and crowds. If you have a dog small enough to fly, Santa Barbara does have an airport with flights to and from a few larger hubs, like Los Angeles and San Francisco. If you need travel reservations for convenient flights and hotel accommodations to any destination, visit VoyageMonkey.com Travel, or call us at 650-368-6192. You can book online or call our travel consultants who can assist you in planning your getaway. Flight Rage, is it a New Phenomenon? We have all seen the news stories of recent rage and violence on flights. We’ve seen customers fighting with customers & flight attendants, and attendants fighting with customers. Some of the commentary makes it appear as though this is a new phenomenon. Is it caused by airlines offering tighter seating and less leg space, thus creating a hostile environment? Is it unfriendly flight attendants with control issues and an authority complex stemming from powers granted to them after the 911 terror attacks? Have the airlines simply adopted a cattle transport approach to customer service, or is it excessive alcohol being served causing intoxication and unruliness? All of these probably play into the problem. Go to VoyageMonkey.com Travel for the best flights, hotel accommodations, and car rentals. As a frequent flier, none of this is new to me; it has gone on for a long time and is nothing new. Years ago I saw a coach passenger be arrested upon landing for disobeying the flight attendant and using the first class rest room. The attendant locked him in the restroom until a flight marshal was called to take him to his seat and hold him there until airport police could remove him from the flight. I believe technology advances have allowed us to capture these events more easily and provided us with a broadcasting forum. We were all simply unaware of past flight rage events as they were not captured on video and broadcasted. The airlines kept them quiet. Cell phone makers have all upgraded their video capabilities and made it super simple to quickly begin filming an event as it unfolds. We all carry these devises now. Once the video is captured we all have the easy capability of wirelessly downloading the event to multiple social media sources. Actual news agencies and television broadcasting networks monitor the internet social media sites for news stories that are trending and getting views. In turn, these stories end up on prime time news and a story is created around it with commentary and opinions. Less face it, airlines are actually serving less alcohol on flights today than in the past. I remember a day when really intoxicated people were allowed to board flights. The good news for all of us is that this has been a wakeup call for the airlines. They are afraid of the power of the customer through social media. The airlines are revamping some of their policies and training programs to prevent some of these events from occurring in the future. I have noticed much more customer friendly flight attendants on some recent flights. Will flight rage continue? Probably, but let’s hope we see better treatment of the customer by the airlines. The customer now has a powerful friend. 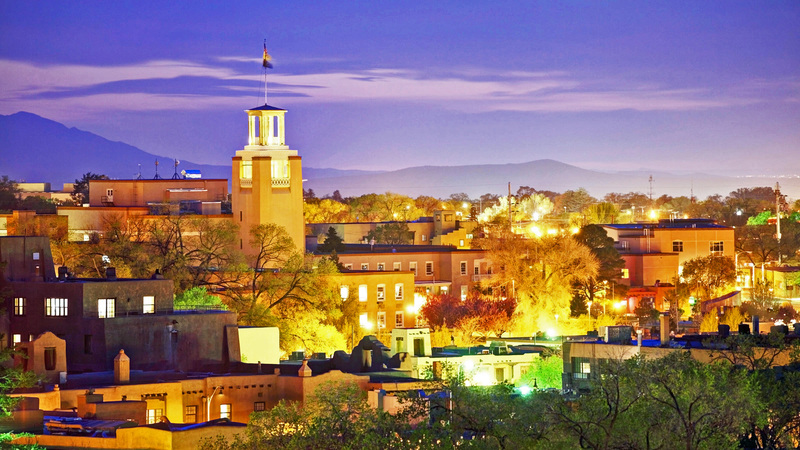 Santa Fe New Mexico is known for its fresh mountain air and its artistic community. It has long been a gathering center for creative artists. Santa Fe is located in the Sangre de Cristo foothills, close to skiing in the winter and great hiking, biking and horseback riding the rest of the year. There are four major ski resorts within a two hour drive from Santa Fe. Santa Fe is renowned for its Pueblo-style architecture and southwestern lifestyle. Santa Fe dates back to 1610 when it was founded as a Spanish colony. The surrounding historic districts feature old adobe landmarks like the Palace of the Governors. It’s easy to get to Santa Fe from most major airports, and the city has wonderful accommodations. Go to VoyageMonkey.com Travel for the best hotel accommodations, flights and car rentals. The central gathering spot and heart of the city is the old Santa Fe Plaza. The Plaza is surrounded by many city landmarks, shops, restaurants and points of interest. There are many places of interest and sites to see in Santa Fe, including the Palace of Governors, the Museum of Indian Arts & Culture, the Georgia O’Keeffe Museum, the Cathedral Basilica of St. Francis, the Loretto Chapel, San Miguel Mission, Museum of International Folk Art, New Mexico Museum of Art, New Mexico History Museum, the Santa Fe River Park, and much more around the Santa Fe historic district. The town is lively and full of art markets and street venders. Most people who come to Santa Fe will also visit Canyon Road, just east of Santa Fe Plaza. Canyon Road is a wonderful place to walk the quaint street through the artistic cultural center of Santa Fe. Canyon Road is an art lovers Mecca. It is filled with rich history, beautiful architecture, shops & boutiques, many unique art galleries, restaurants and bars. It’s a great place to meet and talk with some of the local art community. Here you can experience the true feel of the Santa Fe lifestyle. Aside from the physical art around town, there are also wonderful performing arts to be found in Santa Fe. Choose from the Santa Fe Opera House, the Lensic Performing Arts Center, the Santa Fe Playhouse, the Santa Fe Symphony Orchestra, Aspen Santa Fe Ballet, Santa Fe Bandstand, and the Greer Garson Theater Center. In the summer months you will find free concerts around town as well as local fiestas, or festivals. You can listen to many great musicians around town in just about every corner. The clubs, bars and restaurants are lively at night. Mix some of the best Southwestern food with a little entertainment and you have the makings of a perfect evening. Try some local New Mexican food at Sazon, the Palacio Café, Café Pasqual’s, or Tia Sophia’s. You will find some outstanding accommodations in and around Santa Fe. If you like superb service and 5-star luxury, the Four Seasons Resort Rancho Encantado Santa Fe caters to the luxury traveler. Other luxury resorts include the Rosewood Inn of the Anasazi, the Encantado Auberge Resort, Inn and Spa at Loretto, the Inn at Vanessie, and La Posada de Santa Fe. You will find many moderately priced hotels as well as well rated discount hotels that have great central locations and comfortable accommodations & amenities. If you need travel reservations for convenient flights and hotel accommodations to any destination, visit VoyageMonkey.com Travel, or call us at 650-368-6192. You can book online or call our travel consultants who can assist you in planning your getaway. Charlotte North Carolina is a wonderful small city to visit in the South East. It’s located along the border with South Carolina and centrally located between the Appalachian Mountains and the coast. This makes it a great hub to visit a lot of this southeastern region of the country. It is nicknamed the Queen City and the international gateway to the south. Getting there is easy as there are many direct flights to Charlotte from most major U.S. airports. Once there, the interstate highway system makes it easy to visit many attractions in the region. Go to VoyageMonkey.com Travel for the best hotel accommodations, flights and car rentals. 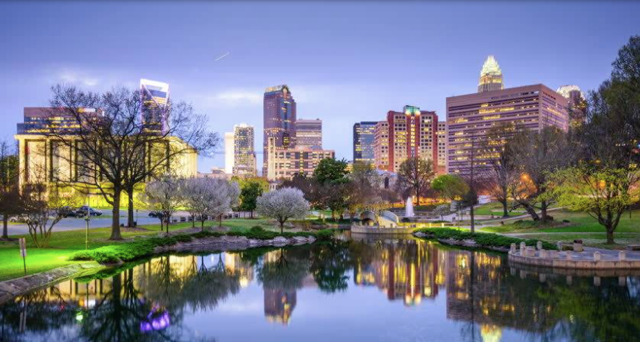 Top attractions in Charlotte include the NASCAR Hall of Fame, the Charlotte Motor Speedway, the Mint Art Museum, Discovery Place Science Museum, Aviation Museum, the Carowinds Amusement Park, and the city’s 100 acre Freedom Park. There is also the National Whitewater Center, a 500 acre man-made whitewater rafting facility and water sports center. It includes plenty of land activities like zip-lining, rock climbing and mountain biking. For the history buff, you can enjoy the Levine Museum of the New South, which explores post–Civil War history in the South. While you are in Charlotte be sure to catch a Carolina Panthers NFL game at the Bank of America Stadium, or a Charlotte Hornets NBA Basketball game. There are many other attractions in and around Charlotte, including the Billy Graham Library and the Hendrick Motorsport Complex. Just outside of Charlotte you’ll find beautiful wooded areas and lovely country roads. Take a scenic drive to nearby Lake Norman and hike around its beautiful Jetton Park woods. The large recreational lake has plenty of good fishing and watersports like jet skis and boating. Nearby you can visit the Carolina Raptor Center to see these wonderful winged creatures, or visit the Latta Plantation (a working plantation). If you like shopping or want a good lunch or dinner in the area, stop by the beautiful Birkdale Village. A popular day trip from Charlotte is the scenic 130-miles drive up to the mountain city of Ashville, situated in the Blue Ridge Mountains. The City is near the Tennessee border and the Great Smokey Mountains National Park. You’ll find 130 different varieties of trees in the area and the fall foliage is spectacular. The town of Ashville has a gorgeous downtown filled with quaint shops, art galleries, boutiques, coffee shops and restaurants. It is all lite up for the Holiday season. The main attraction there is the famous Biltmore Estate. Touted as America’s largest home, the 250 room mansion was completed in 1895 by railroad baron George Vanderbilt for his family and friends. The 8,000 acre property includes some of the best gardens in the country. For longer road trips that may require an overnight stay, you can visit the coastal Outer Banks or drive to the South Carolina beach resort town of Myrtle Beach. The Outer Banks located in North Carolina are a group of barrier islands stretching along the Atlantic coast nearly 100 miles. It’s a wonderful vacation spot filled with great beaches, outdoor activities including kayaking, jet skiing, and paddle boards, as well as some food fishing. While here visit Kill Devil Hills, the site of the Wright Brothers 1903 first 12-second powered flight. Myrtle Beach is one of America’s hottest beach vacation destinations. At the Myrtle Beach Grand Strand coastline, you can enjoy over 60 miles of soft sandy beaches stretching south from the North Carolina border. The area is great for swimming, sunbathing, surfing and plenty of water sports. You will also find plenty of Myrtle Beach entertainment, music, nightclubs, dining, shopping, golf and activities to enjoy on your visit. While in Charlotte, VoyageMonkey.com travel recommends accommodations at the Hyatt, Le Meridian, Omni, or Ritz Carton Hotel (eat at Rooster’s Grill around the corner). If you need travel reservations for convenient flights and hotel accommodations to any destination, visit VoyageMonkey.com Travel. You can book online or call our travel consultants who can assist you in planning your getaway. Cruise vacations have grown in popularity because of the excellent value and the expanded choices now available to you. The major cruise lines have added more new modern super-ships and more home ports and destinations to choose from. Mixing a few days at the home port cities followed by a fun cruise vacation provides for an awesome vacation of land and sea. Visit VoyageMonkey.com Travel for the best cruise vacations, hotel accommodations, flights and car rentals. Home port cities to spend a few days include Miami, New Orleans, New York, San Juan Puerto Rico, Seattle, San Francisco, LA, and San Diego. Imagine a couple days of San Francisco restaurants, New Orleans Jazz clubs, or New York shopping & Broadway shows followed by a spectacular cruise filled with daily entertainment, casinos, pampering and excellent food. You can see a great show every night, listen to good music, and dine and dance the night away. Most ships are equipped with world-class spas so you can pamper yourself. You get to visit wonderful ports of call without packing and un-packing, and are provided many daily fun filled activities to choose from. Some of the fabulous ports of call include Aruba, Jamaica, Bahamas, Grand Cayman, Alaska, Puerto Vallarta, Cabo San Lucas, the Panama Canal, and many more. Winter time is a popular time to cruise as many of these places are warm and sunny during the winter months and the ocean water temperature remains close to 80 degrees, making it perfect for all kinds of water sports. Beach goers can swim and sun bath keeping up their tans. Families have found the convenience of having their group gather over the holidays and enjoy Thanksgiving, Christmas or New Year’s eve on a cruise ship and leaving all the cooking and cleaning behind. VoyageMonkey.com travel staff have enjoyed many a Thanksgiving turkey dinner on a cruise ship. We highly recommend it. Because of all the competition among the cruise lines, the food on most cruise ships has become really super good over the years. Also, the prices have become very competitive. The cruise lines make much of their profit after you are on board the ship, on drinks, gambling, shore excursions, and extras. So they need to fill all the cabins and sail with a full ship. Accordingly, the price of a cruise per person per day can be as low as $100 dollars per day. Where can you get accommodations and all your meals for less than $100 per day? There are a few retired people out there that have taken up living full time on a cruise ship. For $100 per day, that works out to $36,500 per year. Even if you go with more luxurious accommodations for say $200 per day, you are still getting a deal. 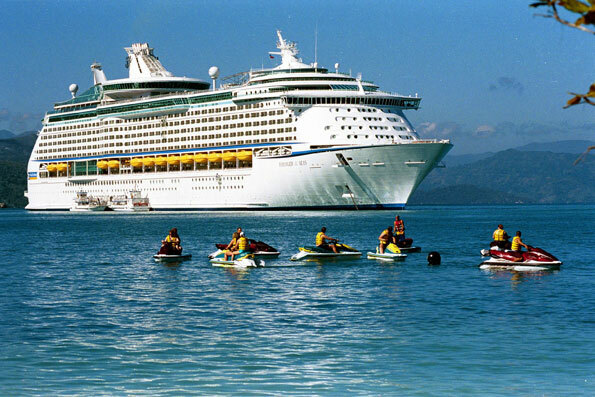 Popular cruise lines include Royal Caribbean, Princess, Carnival, Crystal, Disney, Norwegian, and Holland America. VoyageMonkey.com Travel knows these cruise lines well and can assist you in booking the best accommodations available for the best price. If you need travel reservations for convenient flights and hotel accommodations to any destinations visit VoyageMonkey.com Travel. You can book online or call our travel consultants who can assist you in planning your getaway.